Flight line mechanics employed by defense contractor L-3 Communications at Joint Base Lewis-McChord in Washington state have ratified a new four-year contract. The mechanics, who are all members of District 751 in Seattle, voted unanimously to approve the deal. “We made improvements in every category we identified as our top issues,” said Dave Hosford, the IAM union steward for the group. The workers will see their pay increase by $2.10 an hour in the first year of the contract, thanks to a 3 percent general wage increase plus area wage adjustments allowed under federal law to bring contractors’ pay in line with wages paid for similar work locally. They’ll also receive annual raises of 3 percent, 3 percent and 3.5 percent in the following years of the contract. The contract also improved pension benefits, introduced a lower-cost health care plan, added one extra holiday and one extra day of sick leave and improved the vacation formula so that workers can receive four weeks vacation after 10 years instead of 12. Additionally, new contract language covering temporary duty assignments off-base was welcomed by members. “The new wording for deployments makes sure you have a place to come back to,” said Hosford. 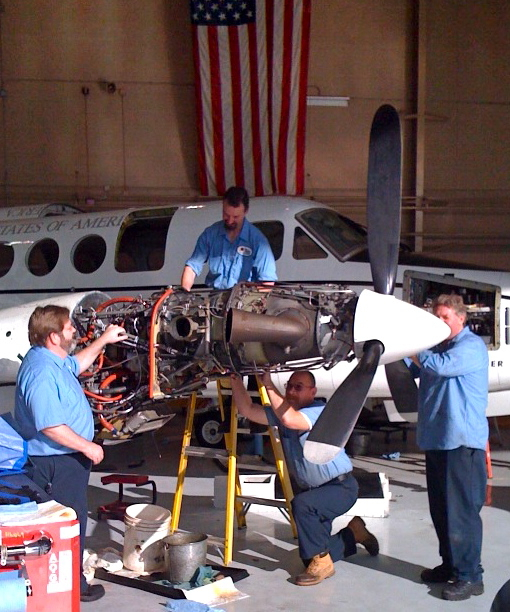 The Machinists who work for L-3 do maintenance on U.S. Army C-12 aircraft. The C-12 Hurons are twin-engined turboprop planes used by the Army for light cargo and passenger transport and medical evacuations. Most carry eight passengers. The IAM represents L-3 workers at 54 sites nationwide. The Lewis-McChord contract was negotiated as part of a deal that covers workers at 13 other sites across the western United States.